I am about to get supremely nerdy in this article, because for one of the first times, I get to talk about two of my favorite things in the world: social science and the Bioshock video game franchise. Because the two are married. The two connect. And with video games being the up and coming and always spreading medium it is, it falls to it as well as others to promote society’s progress. And, while that is a haughty thing to say, perhaps the haughtiest thing I’ve ever typed out on these pages, it is the truth. Art, must, absolutely must, make an effort and a rush to help bring ideas to the world. And to my mind, there is no better form of this than social satire. Comedy and satire exist as a measuring stick and method of exploration of things wrong in the world, without perhaps directly attacking anyone. Well, except, in the case of an oddball political philosopher named Ayn Rand. Because, for my money, the ultimate work of satire in the video game medium is the Bioshock series. Perhaps only matched by Spec Ops: The Line. Let me break it down for you if you haven’t played, or aren’t deep into the holes of the culture of the youth demographic (insert comically dated slang here). Bioshock is a game as Brave New World is a book. In the fact they endeavor to talk about things beyond what you might expect of them. Only with Bioshock, it is an interactive experience. 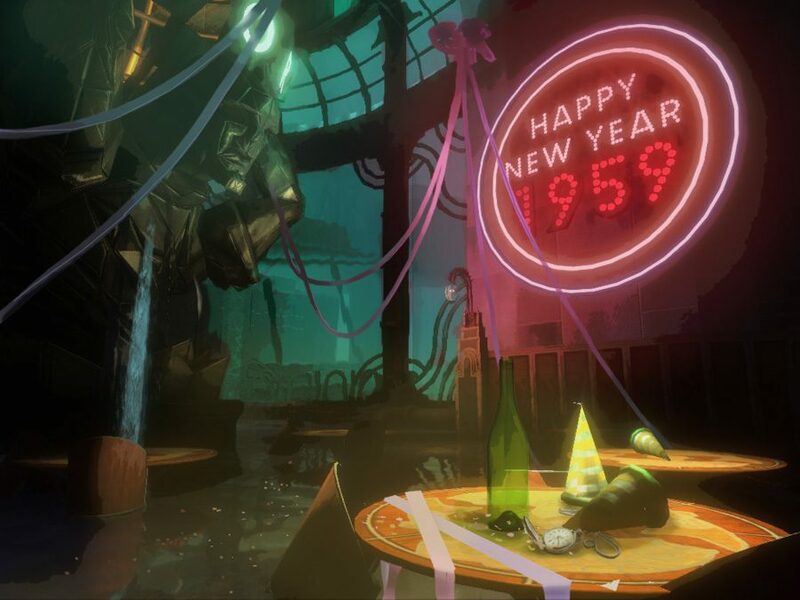 And the story of the game is one that may seem odd a first: set in an underwater city called Rapture, you, the player, find yourself in a situation of life or death. For you see, the city has fallen. Well before you got there. Founded on Randian Objectivism which includes laissez-faire capitalism, the city of Rapture introduced a new method of improving one’s station in life. It is called Adam, and it’s used to make a thing called Plasmids—which give you special abilities. And, because there is no shutting down or regulating this wonder drug…well…. …Everyone goes crazy and turns into murderous addicts to this one method of power. And that’s where you show up. And now, well, here’s the purpose. It’s a criticism. Promotes how messed up the mindset of removing all government oversight is. It promotes a rejection of the things that some people—and political agendas—want to happen. And if you agree. Well, that’s good. I do. I see the problem. But if you don’t that’s good too. Explore how Rapture should have worked without falling. That’s the power of satire. And Bioshock has a lot more to say. Go to Gamestop at Clearwater Mall—or buy it on Steam. Play it, see, if you haven’t already. Games Can Promote Ideas, So They Should, Would You Kindly? Like it or not, it’s the job of media to shape our perceptions of the world. To enhance and question it. To promote understanding and promote an analytical study of the way the world works—the way games work–and what we can sometimes take for granted. And you know what? There’s more than one game in this series. And I think I have more to say on the subject. For when I like something, there’s practically “infinite” I could talk about.